The below article was written by Dr. Eugene Murphey and was published in the May 2007 Tower newsletter. Church furnishings may not sound like a very interesting subject for consideration in our local church history series, but if you pause to think about it, there are many objects around our church that are not only vital to our Christian faith and worship but also have a history that should not be forgotten. In previous articles, we have already considered the beautiful stained glass windows, the musical instruments, the banners and wall hangings. Now let’s look at other on=bjetcs that we often see but perhaps do not consider why they are here in the church or where they came from. Consider the lighted display case in the narthex just outside the sanctuary. 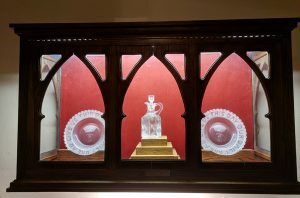 It contains cutglass communion serving pieces – two plates for bread and a small pitcher for wine. These are reported to have been given to the church by its first minister, the Rev. Thomas C. Stuart, a Scottish missionary to the local Chickasaw Indian tribes, and later passed down through several church family members, Mrs. Annie Dozier, Mrs. Nancy Tricem and finally Mrs. Lousie Nanney Godwin. Rev. Stuart had originally organized White Zion Presbyterian Church in 1841 where it is still located today on Highway 6 between Pontotoc and Tupelo. Rev. Stuart and Rev. W.V. Frierson, Sr. were both ministers in that early church, and Rev. Alonzo Todd was probably the first minister of First Presbyterian Church organized in 1867 and located at the corner of North Church and Walnut Streets. Below the display case is an antique Holy Bible that for many years was used on the sanctuary lectern for scripture reading at every church service. The aged Bible published in 1876 by A.J. Holman Company, Philadelphia, Pennsylvania, has become very fragile, so it is kept in the glass-topped chest to help preserve it, hopefully for generations to come. Another Bible of probably equal age may be seen in a protective case in the entrance hall to the Fellowship Hall across from the church library. The Bible case rests on a beautifully ornately carved dark wood chest that once served as the communion alter in the chancel area of the sanctuary. 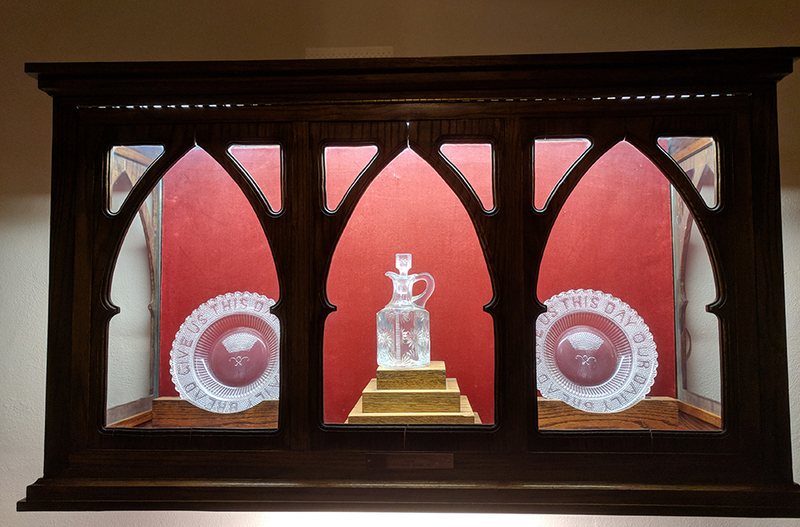 An interesting story surrounds this alter piece in that it was donated to the church many years ago by the late Mrs. Roger Friou as a memorial to her deceased husband. It was used to hold the communion elements until the church sanctuary was renovated in the late 1960’s. Our noted consulting architect, dr, Arland Dirlam from Massachusetts, insisted that in a gothic style sanctuary such as ours the communion furniture piece should be an open table, not an altar. His recommendation was accepted unanimously by the Session of which I was then a member, and I was given the great privilege of visiting with Mrs. Friou to explain our action and get her approval. Needless to say, it was not an easy task but after much discussion she reluctantly but graciously accepted the change with the understanding that the chest (alter) would be placed in another area of the church appropriate to her husband’s memory – hence its present location in the narthex where it is a very striking piece of church furniture. It reminds me and others of the generous gift of the Friou family every time we pass it. This bit of history should also help to remind us that gifts to the church whether memorial or otherwise are dedicated to the glory of God and His Church, and are no longer controlled by the giver. A current example is the many stained glass windows and banners in the sanctuary, all dedicated to God and to church family members both living and dead, but not visibly labeled. This information, as previously noted in a history article, is properly recorded in a public viewing book in the hallway behind the sanctuary. Another striking item of the church furnishing is the large cross hanging above the chancel area of the sanctuary. Soon after the rebuilding of the church following the tornado of 1936, a small opaque glass lighted cross hung there and remained until the renovation mentioned earlier in this article, Der, XXXX also recommended that a larger wooden cross would be more appropriate and in keeping with the facts of Christ’s crucifixion. Mary McMillan, wife of our minister at that time, Rev. Mort McMillan, designed the cross. A local cabinet maker and wood craftsman, Lawrence Timmons and his son, were commissioned to do the job and were successful in constructing a striking wooden cross with hand-carved ends. These men also produced most of the scroll work on the lectern and extended elevated pulpit. These are only a few more of the items in our church home that help us to remember who we are, where we came from. and hopefully, where we are going.